GameStop is one of the few retailers out there that still specializes in selling video games. Sure, you can buy games from places like Target and Walmart, but their selection is much smaller. GameStop offers pre-owned and new video games, pre-owned and new consoles, pre-owned and new accessories, toys, apparel, and so on. It’s a one stop shop for anyone who is interested in video games. A lot of people really love video games, which makes them popular holiday gifts, which means that GameStop is a common holiday shopping destination. Black Friday is always a big deal for GameStop, and they are known to reduce their already low prices even further during Black Friday sales. Recently, GameStop’s 2017 Black Friday ad scan was leaked to the public, which gives us all the chance to preview their deals this year far before the sale actually begins. 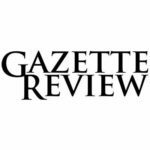 In this article, I will be focusing on a few deals that I think are especially good. However, I won’t be able to get to all of them, so if you want to view a complete list of GameStop’s Black Friday offers, then scroll to the bottom of this article and download the full flyer. 1 TB PlayStation 4 for $199.99, for $100.00 off. This is a really great deal, since you’re able to get a PlayStation 4 with a large hard drive for a good knock off of standard pricing. It’s even better because GameStop includes $50 GameStop gift card with it. So you can buy the console and get yourself some games along with it! Pre-owned Xbox 360 for $0. Yeah, you’re reading that right! That’s not a typo. GameStop will be selling pre-owned original Xbox 360 consoles for $60, with a $60 mail-in rebate. That means that you’re effectively getting the console for free. There’s no reason not to get this one. Nintendo 2DS Zelda Edition for $79.99. The Nintendo 2DS is a very popular console, being more affordable and even sort of more durable than the standard Nintendo 3DS. With this bundle, you get a special 2DS that has the iconic Legend of Zelda: Ocarina of Time 3D pre-downloaded onto it. Assorted Xbox One and PS4 Games for $30, or 50% off. There are a ton of high quality games in this tier. For just $30, you can get a game like Overwatch, Persona 5, Fallout 4 Game of the Year Edition, Project Cars 2, PES 2018, and more. All of these games are on both PS4 and XB1, except for Persona 5, which is a PS4 exclusive. Assorted Xbox One and PS4 Games for $20. There are even more games in this tier. 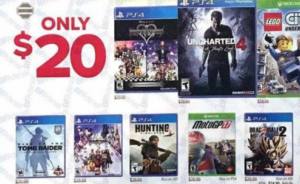 $20 at GameStop on Black Friday can get you Uncharted 4, Rise of the Tomb Raider, Dragonball Xenoverse 2, Dishonored 2, Prey, Final Fantasy XV, Tom Clancy’s Rainbow Six Siege, LEGO City Undercover, and more. Uncharted 4 and Rise of the Tomb Raider are both PS4 exclusives. Assorted Xbox One and PS4 Games for $25. Some of the year’s newest games are included in this tier. It includes games like The Evil Within 2, Wolfenstein II: The New Colossus, Friday the 13th: The Game, The Witcher 3: Wild Hunt Complete Edition, Nier: Automata, Tekken 7, Dirt 4, and more. Nier: Automata is a PS4 exclusive. Assorted Pre-Owned PS4 Games. There’s something for everyone in these deals. For $10 a piece, you can get a game like No Man’s Sky, Uncharted 4, or Batman: Arkham Knight. For $15, you can get Just Cause 3, Fallout 4, or Mortal Kombat X. For $20, you can get The Witcher 3: Wild Hunt, Dishonored 2, or Dark Souls III. In all of these deals, you can buy two and get one free. Assorted Pre-Owned Xbox One Games. A lot of options for Xbox One owners, too! In the $10 tier, there’s Far Cry 4, Halo 5, and Tom Clancy’s The Division. In the $15 tier, you can find Dying Light, Gears of War 4, and Madden 17. Finally, for $20 you can get Dishonored 2, Call of Duty Infinite Warfare, and Naruto Ultimate Ninja Storm 4. Razer BlackWidow Chroma V2 Keyboard for $129.99, which is $40 off. Mechanical keyboards are becoming increasingly popular these days, and Razer’s keyboard are beloved among gamers. This is a great chance to scoop one up for cheap. HTC Vive for $599.99. I know what you’re thinking. That’s what it costs normally. GameStop is bundling a lot with this headset on Black Friday, though. You also get a $50 GameStop gift card, an HTC Vive Deluxe Audio Strap, and a digital download code for the upcoming Fallout 4 VR. Yeti Microphone Assassin’s Creed Origins Bundle for $99.99, which is $40 off. Yeti microphones are some of the best out there, and you get this one for a fair price along with a download code for the latest installment in the Assassin’s Creed series: Assassin’s Creed Origins. When does GameStop open for Black Friday? Like many other retailers, GameStop plans on beginning their Black Friday sale on Thanksgiving. Their doors will be opening on Thursday, November 23rd at 4 pm. GameStop’s Black Friday sale is going to be going on between November 23rd and November 26th, which means it will stretch from Thursday to Sunday. As I mentioned, their doors will open at 4 pm on Thursday. From there, the stores will be opening and closing at standard operating hours. Consult with your local stores to determine these exact times. Can you shop online or is it in-store only? Typically, GameStop offers their Black Friday deals both online and in-store. This leaked ad scan doesn’t indicate any start date or time for an online sale, but they tease several things that will be discounted on their web site in this ad. Keep your eyes peeled in the coming days for a precise start time. However, I think that midnight on Thanksgiving is a safe bet. What is the GameStop return policy? GameStop’s return policy is a little different during the holiday season. Any product that you purchase between October 1st and December 24th can be returned with a receipt by January 15th, 2018. The item must be in resale condition, and if it is a new product, it must be unopened. This lenient policy should allow you to purchase gifts without hesitation! 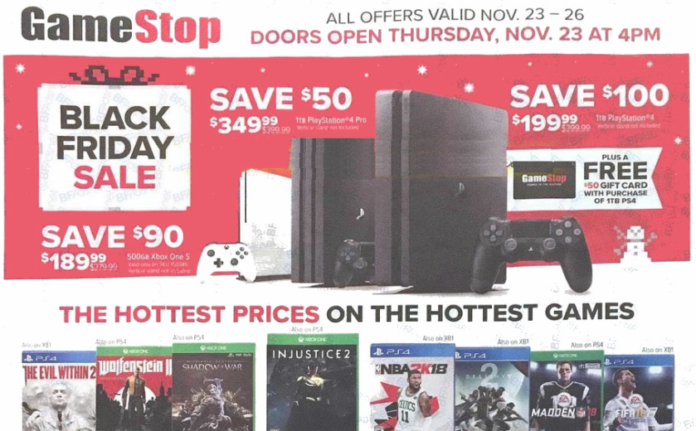 If you would like to view GameStop’s full 12-page Black Friday 2017 ad scan, then all you have to do is click the image of the flyer and you should be able to instantly download or view the complete scan.